LIFESAVING has reached new heights in the City of Joondalup with two new observation towers installed at Sorrento and Mullaloo beaches. 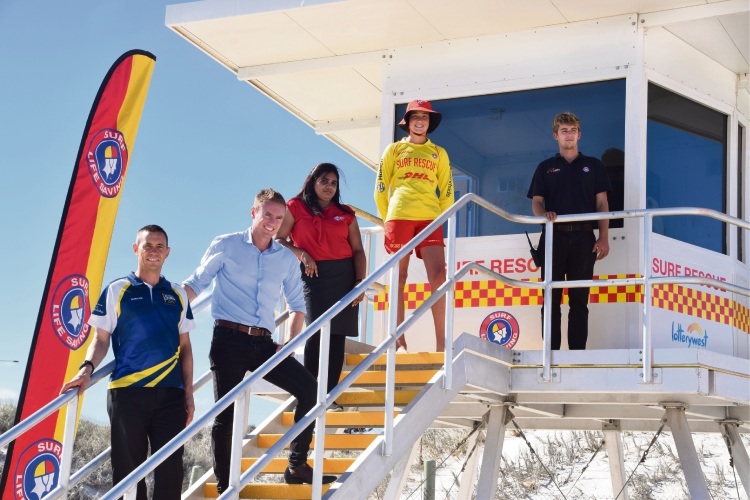 Surf Life Saving WA (SLSWA) general manager Chris Peck said the elevated towers would greatly enhance surf lifesavers’ surveillance capabilities by giving them a view of the whole beach. “Surveillance is the cornerstone of what we do as lifesavers,” he said. “The implementation of these towers will not only increase our lifesavers ability to spot hazards in the water but significantly provide the opportunity to increase our patrolling footprint. “We know that, despite our constant calls for beachgoers to swim between the flags where they are most visible to surf lifesavers, not everyone adheres to this practice. The non-permanent towers provide a nearly 3m-high elevated surveillance platform and an operational station that will improve beach safety by enabling lifesavers to consistently see a range of hazards such as rips, marine life and swimmers in distress, and to respond in a timely manner. “The visibility of these towers will also ensure if the beach-using public need assistance, they know where to find our lifesavers quickly,” Mr Peck said. He said while observation towers were used on beaches worldwide, these modular towers were locally designed and manufactured. The Sorrento and Mullaloo towers are among 10 to be funded by a $750,000 Lotterywest grant, with others already installed at Port Bouvard, Mandurah, City Beach and Scarborough and another four locations to soon be completed. The City of Joondalup also contributed funding.